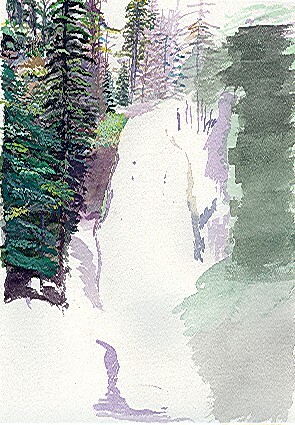 The Story of "Oregon Waterfall"
After laundry and household chores today, I fired up my new Handel and Bach downloads from MusicMatch and broke out the paints. 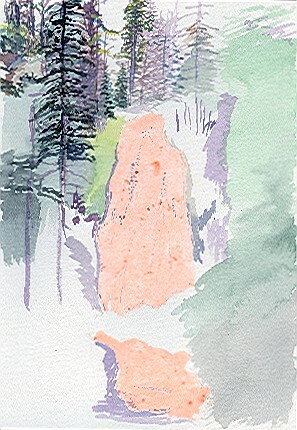 This is from a picture of a spot just east of Mt. Hood where the kids and I had lunch one afternoon while on vacation in the spring of 1997. It was gorgeous. 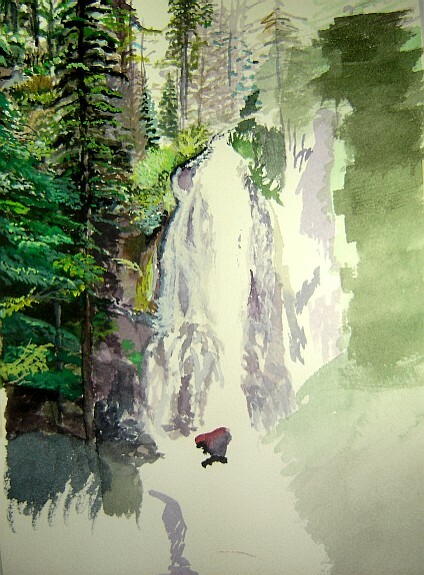 Read the whole story of "Oregon Waterfall"
When I paint, I lose track of time. I'm a little further along... I hope to have the trees in the upper-left completed tomorrow. But now, it's time for bed. I removed the frisket, or liquid resist, and it rolled right off with no problem. I have a picture I'd wanted to do a while ago, but hadn't. I need to find a model because I want to insert someone into the image before I get started. But that's another painting another day. 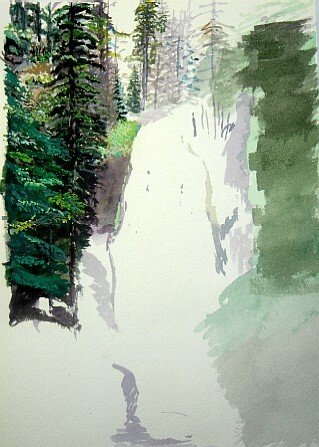 I started this one because I like the memory and the scene, but also because my technique with trees needs work. This is good practice. One thing that I did learn in painting this is that I need to paint from the background out. Which means that no matter how dark the background is, that goes first. With watercolor, that can be tough because lighter colors will just blend into the background colors and you never get a true lighter color. Or, you have to overcompensate, which can lead to strange results. So in this painting, there is a near-black, purplish background for much of the picture. I didn't start with that in my work, and I've realized that acrylics or oils would have been better for this, but I've never used those, so watercolors it is until I get to know those mediums. It's coming along fine. I'm nearing the waterfall itself, so I have to be careful. I had hoped to keep the resist on a bit longer, but there are darker areas near the edge of the water, so I had to remove it. I'm not completely satisfied with my effort on the trees thus far, but I am applying what I learn as I go. We'll see if the trees at the right of the picture turn out differently than on the left. Quite a difference. I hate my HP scanner. In my previous post, I was concerned that my work on the water was not focused enough. I just need to trust the process and keep going. ETC: I've abandoned this painting... 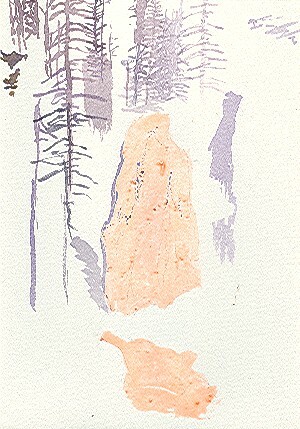 I did some nice work on it, but once you screw up on a watercolor, it's hard to recover.